Career decision is a turning point in every human being’s life. There are millions of people getting graduated every year, get settled in job and earn money for the survival. The real question is how many of them are happy with their job, how many of them know what really makes them happy in their career. Before making a career choice most of us claim they want to do something which they really love to do in their career. But unfortunately, most of them end up to go for a job which pay them more or they really do not know what are their real goals and what fascinates them much. This post is all about few career interest questions which has to be answered by yourself to find a right career choice. There are many surveys found all over the Internet, newspaper or any public media which lists top career choices every year or in mid semesters between to help people to take a decision. But in reality, if becoming an astronaut is a best career option, will it be suitable for you unless it is your dream.? Think about it. There are two types of personality which determines about your focus in life. Analyze which suits you better. 1. Very creative and love to experiment things. 2. A person who takes all opportunities to move ahead. 3. A person who gets scared to take a risk. 4. Very spontaneous and quick at decisions. 5. Always have a back up with alternative plans. 1. A well planned and reasons out everything before they do. 2. Very accurate and punctual. 3. Very reliable and has good knowledge about the future. 4. Always wanting to lead a life with stable income. Every one of them have a special skills which comes naturally to them. Try to understand what really comes as a natural talent and what keeps you awake. Try to list down all possible personal interests which you do not get bored to do. Be sure that every skill set have long way to go either by doing an higher education or a job. So, analyze your natural talent and try your best to proceed it professionally. Deciding on a career path have to be done based on your financial status atleast to some extent. There might be cases where you love to do a job and its financial assurance is not up to the mark. In those cases ask yourself whether is it right to take a job which will put you at risk financially. Your surrounding, where you live is also important when choosing a career path. If you are person where you need to spend lot of time in travel doing your job then think twice about taking the job as for long run it will not keep you happy. And more important thing is, your environment should be benefited by a job you choose. A career path which is not related to your place will not benefit you or your place as you have less exposure to it. So, ask yourself whether your career choice is right for the place. Ask yourself, are you some one who does not want to travel and who likes to work at desk. It is not wrong or some unethical to do a job which is 9-5 absolutely at desk. Doing a paper work is never a bad option as it depends on personal choice as well you might be some one who is very accurate on it. Being an extrovert or an introvert also plays a vital role when you choose your career path. There are jobs where you need to meet new persons every day, you will be in situation of interacting a lot with your clients or your customers. So, depending upon your nature there so many jobs which are available for an extroverted person as well as an introverted person so do not hesitate to have a thought about your nature and proceed. Ask yourself what career path is right for me. This might look as a simple question but it really matters a lot to any kind of individual. You might be a person who loves to work with time flexibility giving importance to personal life or you also might be someone who can work easily in night shifts. So, ask yourself what is your thought about work life balance before you choose a career. Attending board meetings, new product launch campaign or you might be directly involved in marketing by the choice you choose for your career. So, know yourself better about how well can you socialize in the society before you choose a preference about your career path. Nobody wants to be in a stressful environment. But there are people who know the art of handling tough situations and take better decisions. On the other side, there are people who cannot take stress or make a good decision when they are forced at pressurized environment. Finding the right career is very important in everybody’s life. 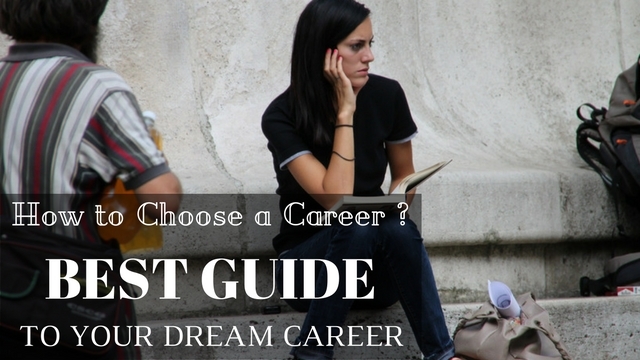 Here are few tips on how to pick a career and how to proceed after choosing a career path. Doing an internship is one common and easy way to know how much you like your choice of career path. It will help you have a better understanding about the job as well it will give how much you can contribute the choice of career path. Remember doing an internship have always choice of quitting it and switching to another choice of career which is not possible when you take a full time job role. Every one will have some one whom you trust, who knows you well, or will have a wider knowledge about the various career opportunities and choices. Choose a mentor or a guide to help you choose a right career path. Take suggestions on how to decide on a career and whether you will be able to proceed with the given choices in hand. This is also equally important when comparing to other tips. Knowing better the market standard of your choice of career is always good. Do a good research about the career choice, like about its market stability, its salary pay scale limits as well as its future in forth coming years. Every one might have few limitations in taking up a choice of career. Do not forget those or console yourself if you might over come it in future. Being positive is good, but it not should be something which will cause you quit in middle. Planning your limitations is important and then proceed with your choice. Even though you take a good choice or a bad choice any decision needs its time. Never give up until you have given your best. Shining in career depends on how long you proceed overcoming the difficulties. So, never quit, try your best to give your maximum. Every single person has their own choice of interest, unique capability, and understanding of life. No one can have a common choice by all when it comes to career. Choose a interesting career which suits your personality and circumstances. Hope this post fuels you a lot about how to choose a right career path and have a proper career planning.